​inCube Arts SPACE is delighted to presented INTERLACE: Three Artists in the Cambodian Diaspora curated by Loredana Pazzini-Paracciani. The exhibition includes mixed-media installations, video works and performance, and gathers three female artists from Cambodia/United States. It will run from June 10 through 30, 2016. Between 1975 and 1985, during and after the Khmer Rouge regime, an estimated one million people fled Cambodia, and over 100,000 Cambodians resettled in the United States, while others took refuge in Canada, Australia and Europe. INTERLACE: Three Artists in the Cambodian Diaspora looks at the artistic practice of Anida Yoeu Ali, Amy Lee Sanford and LinDa Saphan, three female artists of the same generation who grew up as refugees in foreign countries, invested with the dilemma of dealing with issues of hybridity, otherness and displacement. While they continue to negotiate their diasporic positions in their lives, the works featured in the exhibition reveal their migratory past as a significant time of transition. Their artistic journeys, geographically undertaken in disparate parts of the world, come together in this exhibition through a personal yet universal narrative that weaves together motifs of their Cambodian origins with the concerns of all. On one hand INTERLACE examines Ali, Sanford and Saphan's fractured memories of their native past to challenge new ways of thinking and acting, and inspire new possibilities. On the other hand the exhibition touches on the role of the woman in Cambodian culture, and unpacks in the case of Ali's video works, crucial issues of social and religious identity. In what form do these main threads of thought shape, conceptually and formally, the responses of the three artists to their diasporic condition? In the floor installation Full Circle, Unbounded Arc, Amy Lee Sanford recomposes the shards of her Cambodian identity through the gesture of breaking and reassembling unglazed Cambodian clay pots, which become the locus of healing after destruction. Sanford will perform Single Break Pot: West 52nd Street on the opening night—in which she will sit on the gallery floor, and break and repair one Cambodian clay pot. LinDa Saphan's new body of work Back Home compiles delicate paper collages and mixed-media sculptures that trace images of her life from the time she was smuggled across Cambodian borders to her early days in Montreal, Canada, and then New York where the artist currently resides. 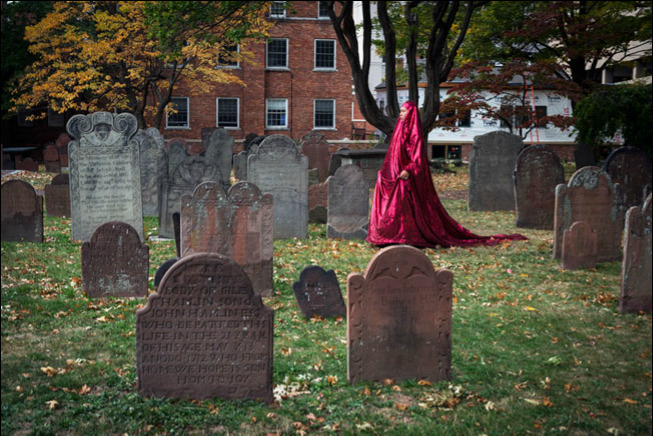 In the video works from the Red Chador performance series Anida Yoeu Ali, who grew up as a refugee in a traditional Muslim household, dressed in a sparkling red chador, takes the streets of Hartford—where she lived and worked as a visiting professor at Trinity College—to tackle crucial issues of growing Islamophobia in the United States today. The exhibition also features the ongoing performance and video works The Buddhist Bug, part of Ali’s repertoire. Encompassing a variety of mediums, spanning from video, collage and mixed-media installation, INTERLACE: Three Artists in the Cambodian Diaspora tackles the contemporary relationship with memories and the recollection of small narratives beyond mainstream histories. At the same time, stemming from the artists' local awareness and global perspectives, the exhibition looks at universal concerns that are able to invest a broader audience with a participatory role in experiencing and responding to the works by ultimately dwelling on their own migratory experience. Anida Yoeu Ali’s artistic work has been the recipient of grants from the Rockefeller Foundation, Ford Foundation, the National Endowment of the Arts and the Illinois Arts Council. Ali earned her B.F.A. from University of Illinois (Urbana-Champaign) and an M.F.A. in from School of the Art Institute Chicago. She is a founding collaborative partner of Studio Revolt, an independent artist run media lab in Phnom Penh, Cambodia. Studio Revolt’s public performances and resulting images of Gallery X and Public Square were part of Our City Festival 2011 and 2012 (Phnom Penh). The Buddhist Bug, has been exhibited in Phnom Penh galleries, Singapore International Photography Festival, Malaysia Heritage Centre Singapore, Southeast Asia ArtsFest London, and featured at the 5th Fukuoka Asian Art Triennale , and is currently part of APT8 at Queensland Art Gallery , Australia. She lives and works in Chicago and Phnom Penh. Amy Lee Sanford is a Cambodian-American visual artist working in both two and three dimensions, and performance. Her work explores the evolution of emotional stagnation, and the lasting psychological effects of war, including aspects of guilt, loss, alienation, and displacement. She was born in Cambodia in 1972 and just before the Khmer Rouge took over the country, was sent to live in the United States. Amy studied art, science, and engineering at Brown University and furthered her art studies with individual courses at the Rhode Island School of Design, University of Massachusetts/Dartmouth and Harvard University. She has exhibited widely internationally, including in Cambodia, Thailand, Australia, Germany, Singapore, Korea and the US. She will perform several Single Break Pot performances for the upcoming Images Biennial in Denmark in June, 2016. She lives and works in New York, Phnom Penh and Boston. LinDa Saphan was born in Phnom Penh, Cambodia. Fleeing the Khmer Rouge regime, she lived for more than two decades in Canada and France. In 2005, Saphan co-founded Visual Arts Open in Phnom Penh and she established the “Selapak Neari” program in 2006, providing workshops, networking opportunities, and an exhibition space for emerging female artists. As a visual artist, LinDa's work has been included in several exhibitions throughout Cambodia, Myanmar, Kenya, Hungary, Singapore, France, and the US. Saphan earned a PhD in Sociology from the Sorbonne in 2007. Saphan is also an associate producer and researcher for the documentary film directed by John Pirozzi Don't Think I've Forgotten: Cambodia Lost Rock and Roll released in 2014. The film tracks the twist and turns of the political turmoil of Cambodia's modern history through the lens of rock and roll. She is currently an Assistant Professor of Sociology at the College of Mount Saint Vincent. She lives and works in New York. Loredana Pazzini-Paracciani is an independent art curator, writer and lecturer who focus on contemporary South East Asian art. She has a Master of Arts degree in Asian Art Histories and is currently based in London. Loredana works extensively with commercial and public galleries and institutions in Singapore, Bangkok, London and New York, championing awareness of critical issues of contemporary Southeast Asian culture through the works of young and emerging artists from the region. During her 15 years in South East Asia Loredana collaborated with the Singapore Art Museum, the Art Incubator programme at LaSalle College of the Art, Singapore, and the 2013 & 2014 editions of Art Stage Singapore. Recent curated exhibitions include Asylum Seeker: The Pond and the Fireflies. A solo show by Prapat Jiwarangsan at The Jam Factory, Bangkok (2016), REV|ACTION: Contemporary Art from Southeast Asia at Sundaram Tagore Galley, New York (2015), and Architectural Landscapes: SEA in the Forefront at the Queens Museum, Queens, New York, part of inToAsia Time-Base Art Festival 2015.